“America’s St. Andrews, a new coffee-table book by Blaine Newnham, tells how the creative design and breathtaking views of Pierce County’s Chambers Bay golf course succeeded in attracting the U.S. Open golf tournament this June. The most significant sports event is the history of the Pacific Northwest is only a few weeks away, and an ambitiously titled coffee-table book tells the story of the stage on which it will be contested. 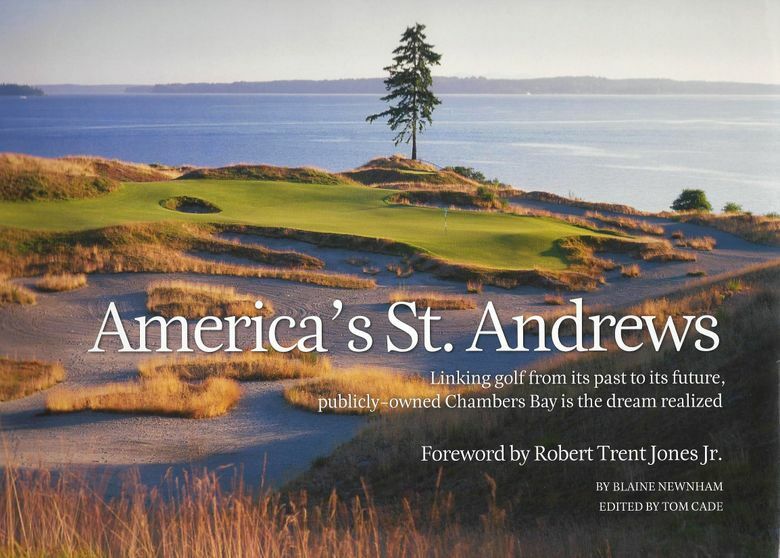 “America’s St. Andrews” is a vibrant, hardback book about the development of Chambers Bay golf course and how it came to host one of the world’s most esteemed tournaments. The public course in University Place south of Tacoma will be the site of the U.S. Open June 18-21 and will test the world’s best golfers. You don’t have to know the difference between a 6-iron and a 6-pack to enjoy the photography in this book. There are more than 160 photographs, nearly three dozen of them full-page or bigger. The contours and colors of the course, Puget Sound and the Olympic Mountains co-star in the most striking photos. Chapters are short, informative and well-organized. Sidebars are used effectively. It is a smooth read in a book appropriately dominated by photographs. Chambers Bay is a stunning, cinematic golf course unlike any other in the state. There is only one tree on the layout and in dry months the course can be brown rather than green. When viewed from the street above, all the mounds, valleys and large sandy areas make it look like the setting for a science fiction film or Animal Planet episode rather than a golf course. Ten years ago, Chambers Bay was an abandoned sand and gravel pit, much of its contents having been used to build Seattle’s skyline. It was transformed by golf designers who considered it God-kissed land (these folks love sand) into such a beguiling and challenging course that only eight months after it opened in 2007 a startling announcement was made — the course was selected by the United States Golf Association to host the 2010 U.S. Amateur and the 2015 U.S. Open. The book’s title is derived from St. Andrews in Scotland, the publicly owned historic course that serves as golf’s holiest shrine and is the site of this year’s British Open. Townspeople can walk the grounds at St. Andrews on Sundays, a day when no golf is played. At publicly owned Chambers Bay there is a 3-mile public walking path that cuts through the course and is busy every day. Chambers Bay is modeled on the links-style courses of Scotland — built on sand and bordering the sea, although in this case railroad tracks are closest to the water. The grass is of fescue varieties, just like Scotland. The author of the book, which has won a golf-industry award, is Blaine Newnham, a familiar name to Seattle Times readers because he was a sports columnist and associate editor of the newspaper for 23 years. His partner in this project was editor Tom Cade. Newnham chronicles the enormous gamble by John Ladenburg, former Pierce County executive, in using his political skill and muscle in office to go all-in for a world-class course at a cost of $24 million in pursuit of the Open. Ladenburg’s reasoning: If Chambers Bay got the Open, it would become a national attraction for golfers and Pierce County tourism will benefit for decades. Among the key decisions: To build 18 holes instead of 27 (more room for design creativity), to use fescue grasses even though they are more fragile than other types, and to ban motorized carts to reduce wear on the course and give architects more room in tight areas. Traditionally, most of the venues for the U.S. Open have been pedigreed, elitist Eastern golf clubs. However, fresh air and fresh ideas have been blowing through the USGA headquarters in New Jersey starting with the successful 2002 Open at Bethpage State Park in New York, the tournament that prompted Ladenburg to think big. This year, those winds blow in Pierce County’s favor and the world will be watching. Craig Smith is a retired sports writer for The Seattle Times.